Need some reassurance that spring is on the way? Well, there may already be some shrubs blooming near you. 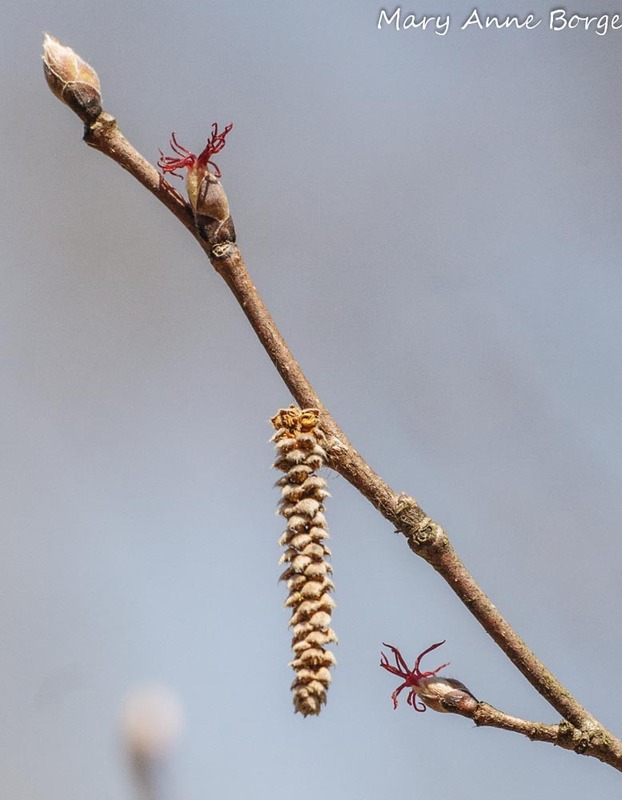 Look for the flowers of my favorite harbinger of spring, American Hazelnut (Corylus americana), or its close relative, Beaked Hazelnut (Corylus cornuta). 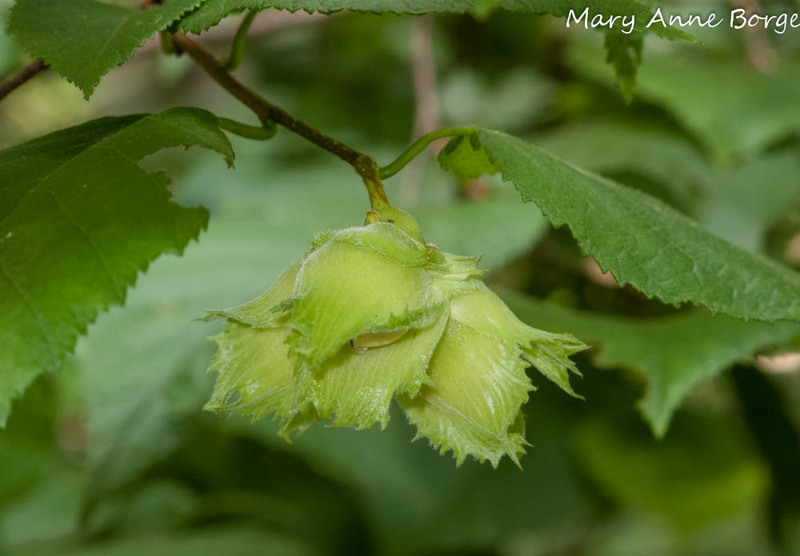 Hazelnuts can be found in rich woodlands, wood edges, thickets and along roadsides. They’re blooming down the road from me now. With separate male and female flowers on the same plant, both species of hazelnut enlist the assistance of the wind in their pollination efforts. The flowers bloom before the leaves emerge, increasing the odds that the wind will successfully transport the pollen grains from the male flowers to a compatible female flower, since there are no leaf surfaces to impede the pollination effort. 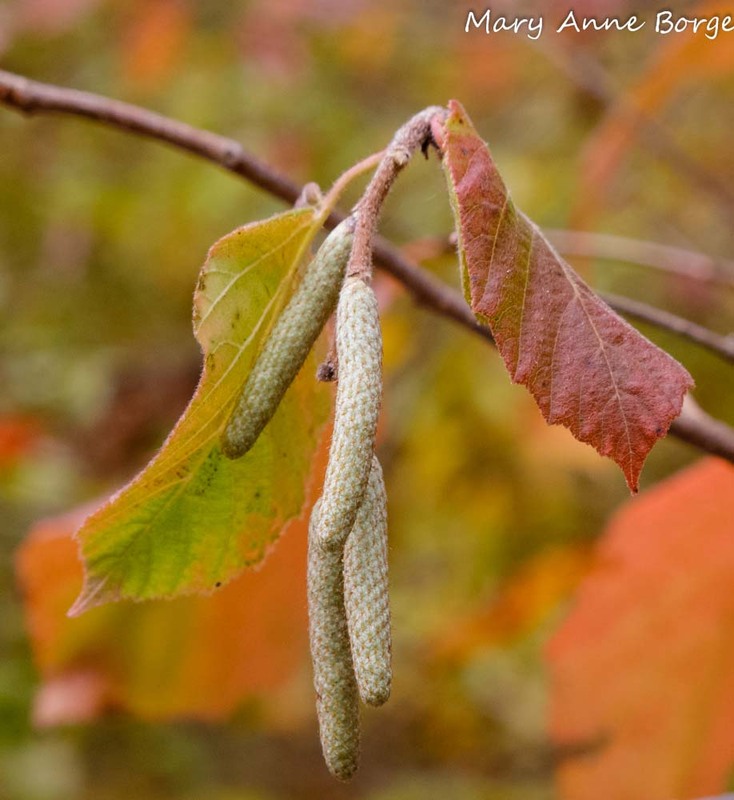 Cream colored catkins containing the male flowers are visible from fall through winter, hanging stiffly from the hazelnut branches. 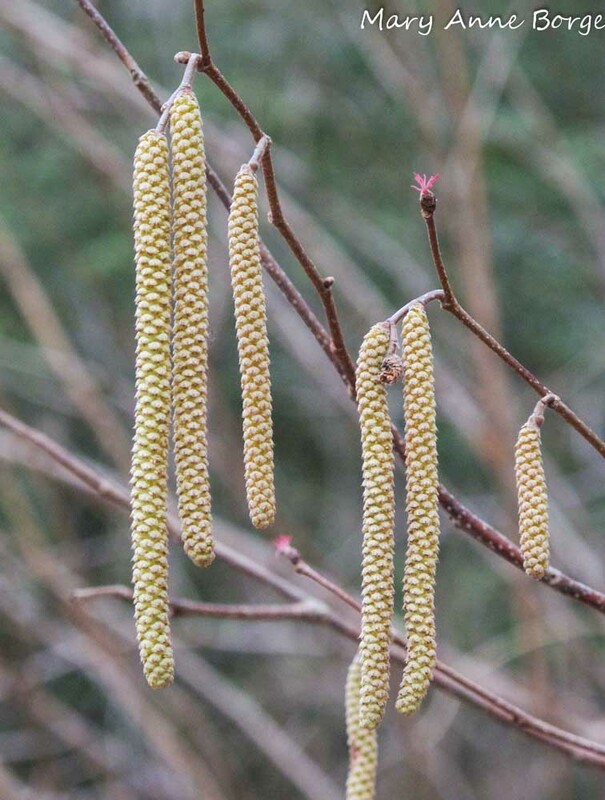 As the winter winds down, the catkins grow longer and looser, their color evolving to include a hint of yellow. At maturity, thousands of tiny grains of pollen are released from the cluster of male flowers encompassed by the catkins, traveling on the wind in search of a female flower as a mate, preferably on a nearby compatible hazelnut. Pollination with a separate plant expands the gene pool, and increases the likelihood of successful offspring. The female flowers are wonderfully gaudy in a subtle, inconspicuous way. 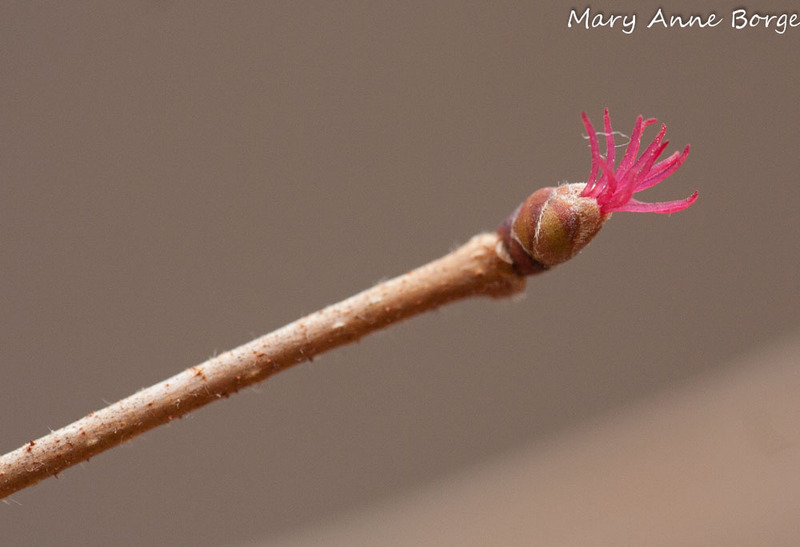 Usually found at the tips of branches, the buds appear to be small and reddish brown during the winter. In bloom, the female flower parts resemble tiny, bright magenta sunbursts. Check the hazelnuts branches to see these petite, spidery female delights when the catkins containing the male flowers elongate and move freely in the wind. If the flowers are successfully pollinated, nuts are produced, ripening by late summer. While the shrubs are fruiting these two species of Hazelnut are easily distinguished. The flowers of the two species are very similar, but the nuts have very distinctive coverings. American Hazelnuts have a leafy sheath with a ruffled edge. Beaked Hazelnut’s coverings are long, tubular and beak-like, giving this species its name. The nuts, also called filberts, are edible, although these North American species have generally not been grown as a commercial crop. A European species with larger nuts is grown commercially. Scientists from the Hybrid Hazelnut Consortium, whose members are Rutgers University, Oregon State University, Arbor Day Foundation and the University of Nebraska–Lincoln, are working to develop hybrid hazelnuts as a sustainable crop that can be grown in much of the United States and Southern Canada, to produce food, feed or bio-energy. Humans are not the only consumers of hazelnuts. Squirrels, chipmunks, rabbits and fox are among the other mammals who eat these tasty treats. Birds with beaks strong enough to open the shells for a meal include woodpeckers, Blue Jays, Wild Turkey and grouse. 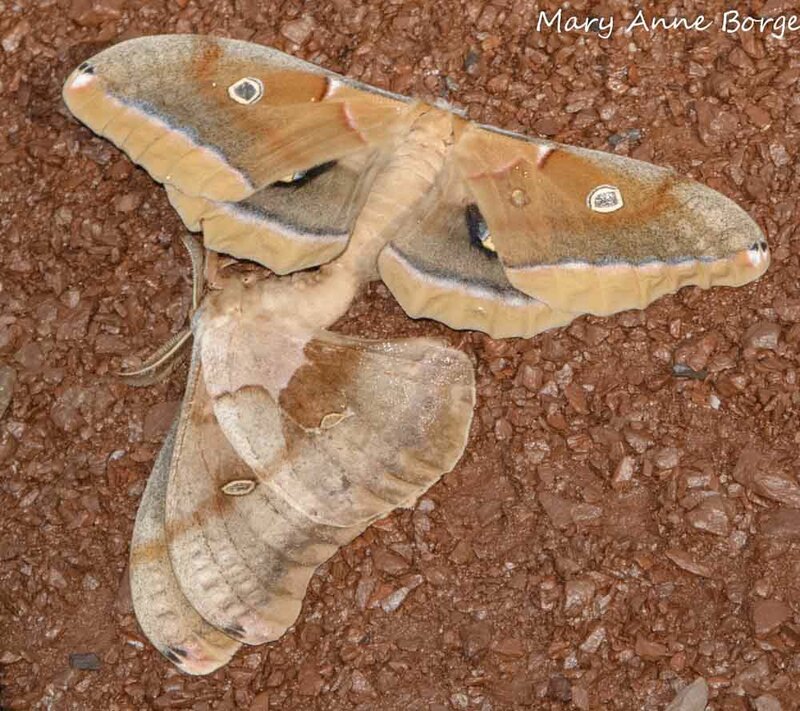 During their growing season, hazelnuts may provide food for many beneficial insects, including some of the most beautiful giant silkworm moths such as the Cecropia and Polyphemus Moths. 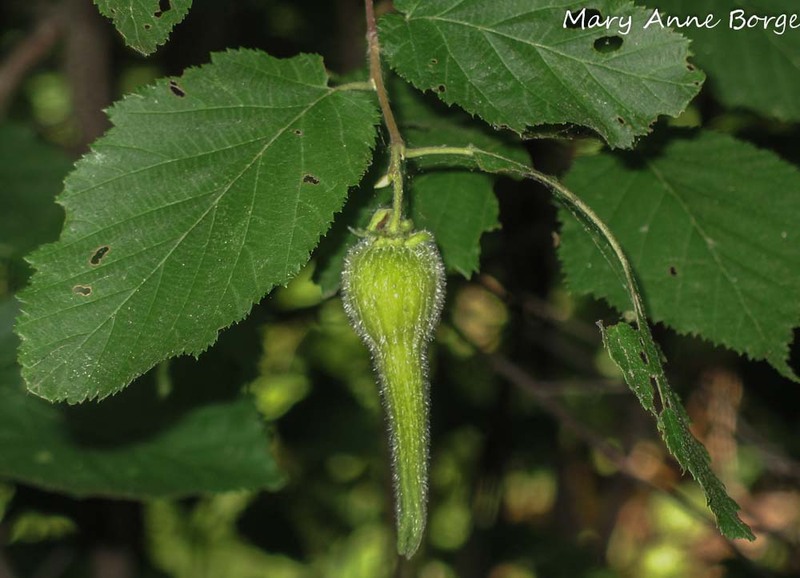 Beaked Hazelnut may also be used as food by Early Hairstreak butterfly caterpillars. According to Douglas Tallamy in Bringing Nature Home, over 130 species of butterflies and moths may use the hazelnuts as caterpillar food plants. Birds rely on these insects and others as an important source of protein, especially during the critical period when they are feeding their young families. The fall color of the leaves may vary from yellow to deep reds. At Bowman’s Hill Wildflower Preserve, near New Hope, Pennsylvania, you can see the two species of hazelnut growing next to each other. At that location, the leaves of American Hazelnut turn luscious shades of red, peach and orange. 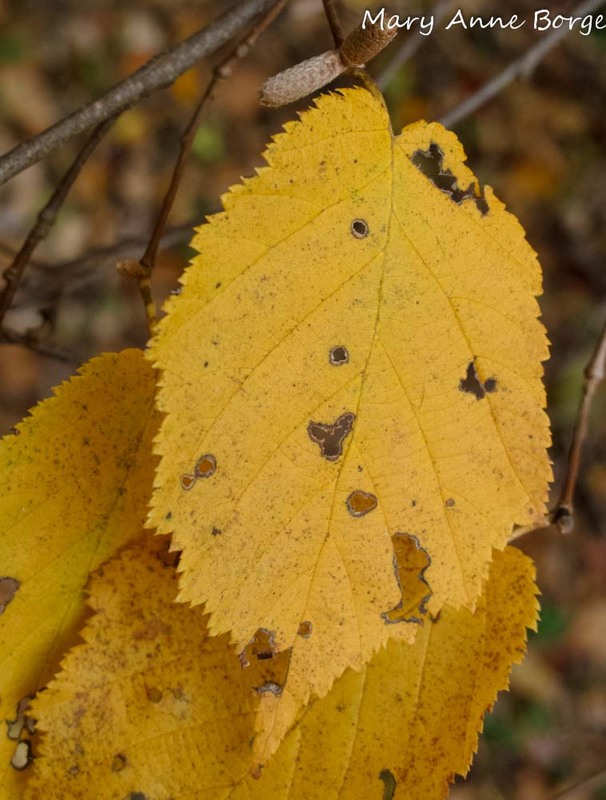 Beaked Hazelnut’s leaves at the same spot are bright yellow. Makes me wonder about the difference in their chemical make-up. These multi-stemmed shrubs grow to a maximum height of about eight to ten feet, and can expand to a ten foot width. They make good candidates for a hedge row, either alone or with a mix of other shrubs. American Hazelnut can tolerate shade to sunny conditions, and moist, well-drained to dry soils. Beaked Hazelnut prefers a bit more sun. American Hazelnut is native to the eastern two-thirds of the United States (except Florida), and to Quebec, Ontario and Manitoba provinces in Canada. Beaked Hazelnut’s native range includes the Canadian provinces from Newfoundland and Nova Scotia west to British Columbia, and much of the northern tier of the United States, southward in the east to Alabama and Georgia, and in the west to California. See if you can find a hazelnut growing near you. 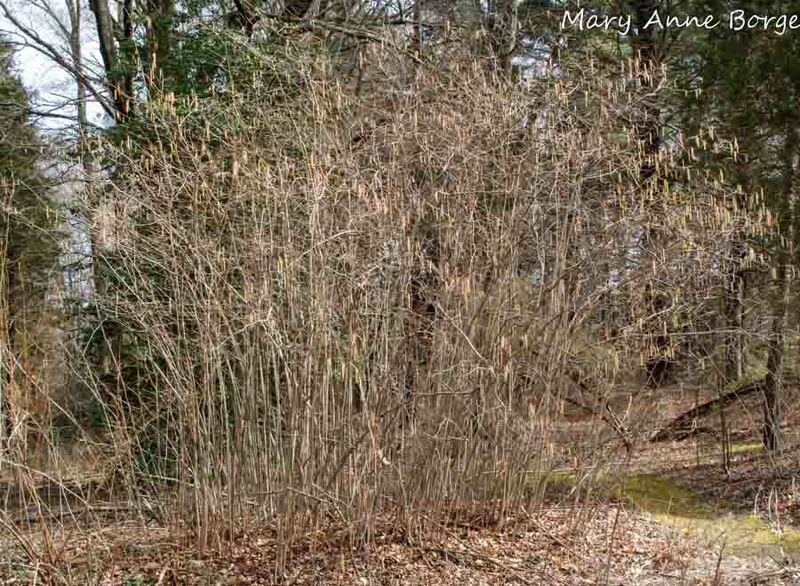 When spring arrives, think about planting this versatile shrub to attract birds, butterflies, moths and other wildlife to your yard. It will also provide welcome assurance that spring is just about here. Bringing Nature Home, 2007, Tallamy, Douglas W.
This entry was posted in Birds, Butterflies, Gardening for Wildlife, Native Plants, Other Insects and Spiders and tagged American Hazelnut, Beaked Hazelnut, Polyphemous Moth, Signs of Spring, Wind Pollination by Mary Anne Borge. Bookmark the permalink. Several squirrel species eat American Hazelnuts. Depending on availability, it can be an important food source for the squirrels. and love seeing the photos and hearing the good news! Great post! Another great post. Will definitly need to plant one in my yard. Thanks, Bobbie! A hazelnut will add year-round interest to your yard. While many folks up here in Northern Minnesota consider the Hepatica, Violets, fruiting shrubs and Marsh Marigolds as our first native spring flowers, I always keep an eye out for the tiny gems of Hazelnut blossoms. I have shown many folks these blossoms, and most had never noticed them before, even after decades of living out here. They are pretty inconspicuous until you know they’re there. Once you know what to look for,they are fabulous!